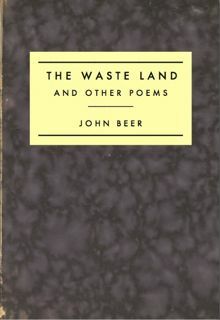 John Beer, The Waste Land and Other Poems, Vanarium Books, 2010.
next noon at the Heartland Cafe. Why do you walk with your face turned from me? All you do is complain and complain. suspended against an amber background. The knot needs to be loosened. Night has come. and guard my glass from the moon. They still refused to answer my questions. I know my life is in terrible danger. and breaks the settled pattern of the sky. nothing returns as we ask it to return. to be heroic, but not in that guerilla theater way. I told him, Sam, it’s time to take off the puppet head. all those books of poetry from Barnes and Noble. that someday they’ll become the next Debord. In the meantime, how am I supposed to live? THANK YOU FOR SHOPPING AT BORDERS. WE WILL BE CLOSING IN FIFTEEN MINUTES. in which you carve space out for yourself? I want to find my happiness on my own terms. where people aren’t afraid to talk about orgasms. the Orphée that just opened at Performers’ Collective. ciao, I’ll see you later, love to all. In the cafe, the boys drank to Orpheus. he waved a half-wave and lit a Gitane. Sirens we were used to, but so early? then returned to my book: The Invention of Chance. This is the song of atomic decay. on F.H. Bradley and the moon. by distillation in the mind. identically, but not the same. One hears the scraping of the key. One wishes one were one, not me. Through darkness he descended to the platform. mirroring the disgraced King of Pop. White noise announced the train. Orpheus wept. sits anxiously beside his stolen bride. paused as we are at the axis of our hope. “The song of policemen has yet to be heard! The song of policemen now carried the day. Each anti-war chanter, each car window soaper. From the untamed community begging his art. And then morning came. They were walking cadavers. But something—divine spark? the soul?—had gone out. Where deadness had come from, how long it might stay. To insert himself. There will be no revision. And that’s how the song of the policemen is done. I was at North and Clybourn. No one was with you? I slipped. The underworld does not forgive. While Joan stirs on in a distant plot. of Jessie Weston. You, that way: we, this way. Picked his bones in whispers. And this I know. Forgot the way of gulls. He rose and fell. His teeth as white as snow. Walk her every day into the deep sea swell. She passed the stages of her age and youth. Orpheus wept. A big big love. A fortnight dead. And this I know. A big big love. A big big love. As tall as you. Orpheus awoke in the poem of disguises, the poem once called “The Waste Land.” Friends, listen up. He gathered the remnants of the life he had dreamed. He renounced the burden of the name he bore. He began to walk. Orpheus walked down Milwaukee Avenue toward the Flatiron Building. He passed bodegas, taquerias, vintage stores. He met a hustler with a gas can. He walked past the anarchist kids. And he walked, and he walked, and he walked past the cabdrivers trading insults in Urdu, and he walked past convenience stores, and he walked past Latin Kings, and he walked past waitresses getting off night shifts, and he walked past jazz stars that nobody recognized, he walked past the students, the teachers, the cops. And the sky was the color of eggplant and tire fires, the sky was the field that resisted exhaustion. And he walked, and he walked past the puddles and gutters. And no one walked with him. And SUVs burned, and the asphalt ran liquid and Orpheus saw the dissolving sky and he knew that the name of the poem he had entered could not be “The Waste Land” or even “White Phosphorus,” or “The Song of Policemen.” In his pocket he fingered a tiny slip of paper. He opened and read it. It said, “This is the death of the poet.” And yes. And yes. This is the death of the poet. Shhhh. I am allergic to melodrama. Shhhh. The serpent encircles the world. Shhhh. There is plausible explanation. Smithing his voice to match plucked strings. And the stones grew red with the blood of the poet. These footnotes have I shored against my ruins. Click here to read John's poems at the Poetry Foundation archive. Click here to read two of John’s poems at Jacket.